[It is] meant as “an interpretation of the scent of skin”...That, and the fact that Guichard apparently “delved into memories of his mother sculpting in marble, a contrast between the heat of the sculptor’s hands and the coolness of the material” is really all you need to know — as described, UFO is a transparent incense-y skin scent, slightly metallic in the top notes, later, more mineral-ish than metallic, with a light, slightly milky sweetness and an almost-velvety finish. Nope. Guichard may have started there — Madly does share several notes with UFO — but the end result is different enough that UFO is a useful reference only insofar as it illustrates what might have been. Madly opens on strong orange blossom, powdery, peppery, milky-sweet (plenty of heliotrope and vanilla) and extremely fresh and clean. What was a transparent incense-y skin scent now smells like a bland but insistent dryer sheet, in the Fresh Flowers scent. It does improve (and lose some of the sweetness) as it calms, and the incense from UFO becomes more pronounced, but it never shakes the household-cleaning-products vibe, and on my skin, the woody musky dry down had faint but unpleasant undertones of something vaguely like plastic. Verdict: an absolute no-go for me, and to my mind, almost comically at odds with its advertising. If you loved it (or if you've even smelled it), do comment! Note that I was testing the Eau de Parfum; the Eau de Toilette (see below) is advertised as a fruity floral but I have not tried it. 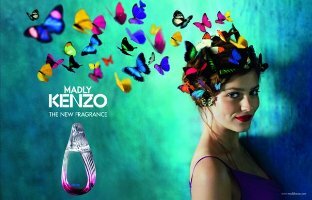 Madly Kenzo is available in Eau de Parfum (purple bottle; 30, 50 and 80 ml; floral oriental with notes of orange blossom, pink pepper, heliotrope, rose, frankincense, vanilla, cedar and musk) and Eau de Toilette (pink bottle; 30, 50 and 80 ml; fruity floral with notes of pear, litchi, heliotrope, jasmine, cedar and musk). Both versions appear to be widely available everywhere on earth except the US; so far as I know it has never officially launched here. I agree , this for me was a total disappointment – bland to the point of invisibility. Shame – the name and the idea of a woman wearing a perfume like a cloud of butterflies was cute and interesting. Yes! And the madness & exuberance and all the other stuff. Too bad about this release. I was hoping it would be like the lovely UFO. Robin, do you know if that one’s long gone or is it still available since Madly sounds nothing like that one? I was hoping too! I did figure this would be more feminine, but hoped that was all. But gosh, that was 2008 — I wouldn’t buy it even if I found it. But no idea, although I don’t think they made very many so seems unlikely. I was just on the Kenzo website about month ago. If you go to order they still have it listed. It doesn’t say anything about it’s being a limited edition, so maybe they decided to keep it in production due to popular demand. I ordered a little from STC, just to check it out. It is really pretty. I wish the initial marble scent lasted longer. The same of-the-moment synthetic aesthetic that made Flower and Amour so compelling is now an albatross for the Kenzo brand, their new releases are harshly chemical. If it’s as you say, and I don’t doubt that it is, then it’s insulting to tie this release through the bottle and claimed “skin scent” aesthetic to UFO. I do think you could take UFO, add some more “florality” & otherwise “femme” it up, and still come out with something miles better than Madly! And I suppose the EdT might be better, but since I don’t care for pear or litchi, doesn’t seem likely that it would appeal to me. Oh, you’re right! I thought I remembered skin scent in the press release from before, but it’s not. 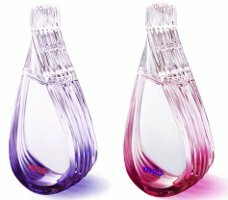 Okay, they get a pass, but one not for releasing a bad fragrance or for not designing a new bottle. I do really love those butterflies. Same! I thought both of the commercials (EdT & EdP) were great fun. I do love both the edp and edt. The edp is a quite weird scent, though still one of the best that I’ve smelled recently. Madly is a typical Kenzo – powdery, but now it is powdery in an unsweet and mature way. I can’t describe the fragrance to the notes, but I feel a woody peppery musky dry down on a powdery background. Madly is done in Japanese style and, yes, it has something masculine inside. Good work, Aurelien! So glad you chimed in, always good to hear the opposing view! Is the EdT much fruitier & lighter? Robin, edt has nothing common with edp. Madly Eau de Toilette is a typical “pink” fruity floral scent. Nevertheless it is very well done and, yes, it’s joyful! The combo of pear and litch here are evident, and these components smell quite natural. Despite the fruitiness the fragrance stays will stay close to skin to my mind. Madly Edt is absolutely another story than Madly Edp, but still lovely and attractive. Got Madly as a new year’s present and I am surprised with the fact that I like it. It is wearable for a fume-freak like me, has a nice peppery drydown, close to the skin, I detect the Kenzo sweet-sour-fuity note but it’s not disturbing … good job for a commercial scent … haven’t smelled UFO or Madly EDP yet. I know – what a let down. Tried it in Argentina, thinking it might bear resemblance to UFO, and was taken aback to find this very pink-peppery fresh thing. B proclaimed it “hideous”. (He’s never shy about expressing an opinion.) Too bad, because I like Guichard and that ad really is adorable. I like Guichard too, and he’s obviously very talented. And for all I know, it’s selling. But I can’t even give this one “well done” and “wearable” — I really found it on the verge of objectionable. And in my list of things it had going for it, forgot to mention the name — that’s a great name, and a shame to have it go to waste. I’ll give this one a try. I’m in Australia and I have seen it at my local department store. I’ve stared at in puzzled fashion a few times because I could not recall it having been reviewed and wondered if it was a really old release. I had not realised that it may not have been distributed in the US. How odd. Anyway, thanks for the review. We do have Kenzo here, but we don’t seem to get all the new releases, or we get them later than other areas. Madly is not even on the KenzoUSA website (and nor is L’Eau 2 Kenzo). I have both UFO and Madly EDP. I bought the EDP because, for me (at least on my skin), it was quite reminiscent of UFO, if perhaps a softer, warmer version of it. I love both, and you can tell they’re from the same perfumer. The EDT however, was far too sweet and floral, and reminded me of Kenzo’s 7.15 in Bali (which I also have). The bottles are adorable and fit nicely in your hand (far easier to hold than the ‘mobius loop’ design on the UFO), and the butterfly theme is too cute. I will definitely repurchase this, and look forward to matching body products etc. Glad to see another “pro” vote, thanks! Aha, thanks — looks like it’s probably a late Nov or early Dec release then. Too bad about Madly, but this review has sold me on UFO. I’ve been having bizarre dreams about incense lately. Also have to say that “A woman’s greatest quality is her touch of madness” REALLY rubbed me the wrong way. Someday I’ll come to realize the futility of getting worked up over wrongheaded messages in perfume advertising, but I guess that happy day has not yet arrived. I, on the other hand, loved the slogan! Maybe its the associations you attach to madness that make the difference? I read it here as more akin to divine inspiration, or at least whimsical eccentricity, than mental illness! Well, that interpretation would certainly fit better with the butterfly image (which I do like). I do see that side of things, but I was in an uber-cranky mood yesterday — which, unfortunately, is sometimes *my* greatest quality. I’m almost immune to getting worked up over PR messages, LOL…but the “madness” thing was doubly ridiculous paired w/ what smells like laundry soap. Or the folks at Kenzo have way more fun doing chores than I do. It reminds me of a standup comic I saw once who said she didn’t buy a plea of “insanity” for sudden crimes of passion like many murders, etc. She said she’d buy it in the case of somebody who broke into your house to do your laundry or dishes. Yep, remember trying this one somewhere abroad and being seriously underwhelmed. Love Kenzo as a house, but not mad about this one. Ditto — I do think Kenzo does a better job than many. I found these quite generic and unremarkable. The reason that is funny is that I quite recently tried Viva la Juicy and actually liked it! The review of it here (which I think may be Angela’s) describes Viva as the quintessential mall fragrance. Maybe its just more original and less derivative? VLJ may be the quintessential mall fragrance, and I do not personally find it all that original, but it’s extremely well done and wearable and pleasant. It is easy to see the attraction of VLJ, and in fact many other mall fragrances have tried to copy it. All of which is (way) more than I’d say for Madly Kenzo. Is 2008 old? I feel like I have lots of perfume from more than a decade ago that still smells fresh! Maybe I just don’t remember what they used to smell like though? The impermanence scares me a little!! Many perfumes last WAY longer than that. Some don’t. It’s sort of a crap shoot. I wouldn’t knowingly buy a bottle that old unless I had no choice (it was discontinued, for instance).